India. Paris. Saffron. These three sisters have been brewing in my imagination for what seems an eternity and now I am so pleased to see them in reality. They were inspired by an article a friend shared about the evolving "look" of the American, literally a melting pot of ethnic mixes. The idea of what is American spoke close to home because my daughter, husband and I are all a mix of various ethnicities and we all identify as an American. And while these sisters are not necessarily American or any other specific nationality, they are for me the face of the what our modern world is becoming, a beautiful blend of ethnicities and cultures. Each sister is a blend of colors and textures. Each sister is interesting in the story she has to tell. India, the oldest of the three sisters, is serious and responsible and full of wisdom, if a bit unconventional. Sometimes she'll give you a quirky bit of wisdom but still meaningful and useful all the same. Her sisters are always coming to her for advice or just to listen to her talk for she always has a story to tell. Her imagination is vast and vivid, uncontained by the confines of this world, has soared through space and roamed the place where fairies live. Paris is the middle child, bright and confident. She has no fear and in fact she can do just about anything. India calls her a bit of a dare devil but really she is not. She loves the sound of trains and often dreams of distant travels. In fact she longs for the return of travel by train, that romantic era where the sounding whistle of the train signaled the beginning of an adventure. 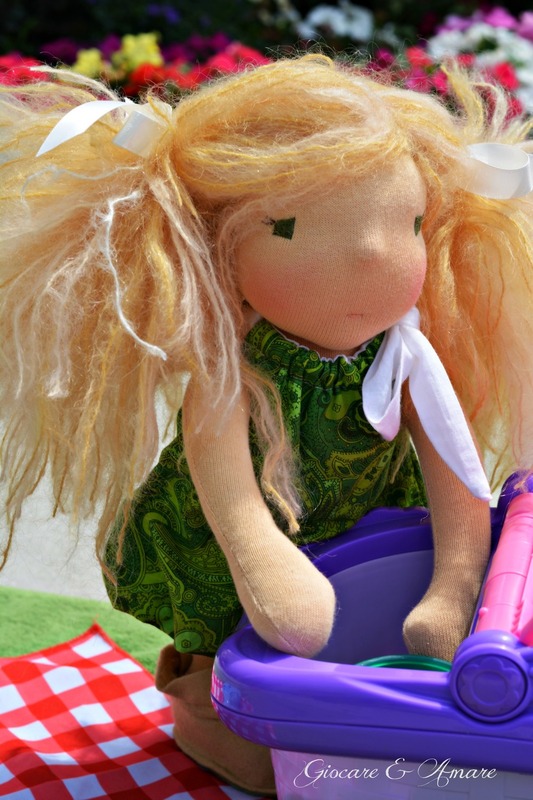 Saffron is the baby of the family and she is totally dependent on her sisters whom she loves dearly. She constantly wears a mysterious smile on her face that leaves everyone wondering what she is thinking about. She has a head full of wild natural hair that her sisters are always trying to tame but she loves letting it just do what it may. Saffron is a collector of things and ideas, and she stores both in her special box. In it she keeps all the things she loves: pictures of her sisters, shells and rocks and dried, pressed flowers, all the colors she finds beautiful and so much more. And Nieve grew tall and lovely. She said, I want NICE clothes. Now I can take a lot, but I looked her immediately in the eyes and said, “Little Miss, I ALWAYS make nice clothes.” She ignored my correction and simply smiled. Nieve should be arriving at her new home today. I already miss that sweet face and those bright green eyes. I did manage to give her one last hug before she left but it was hard letting go. 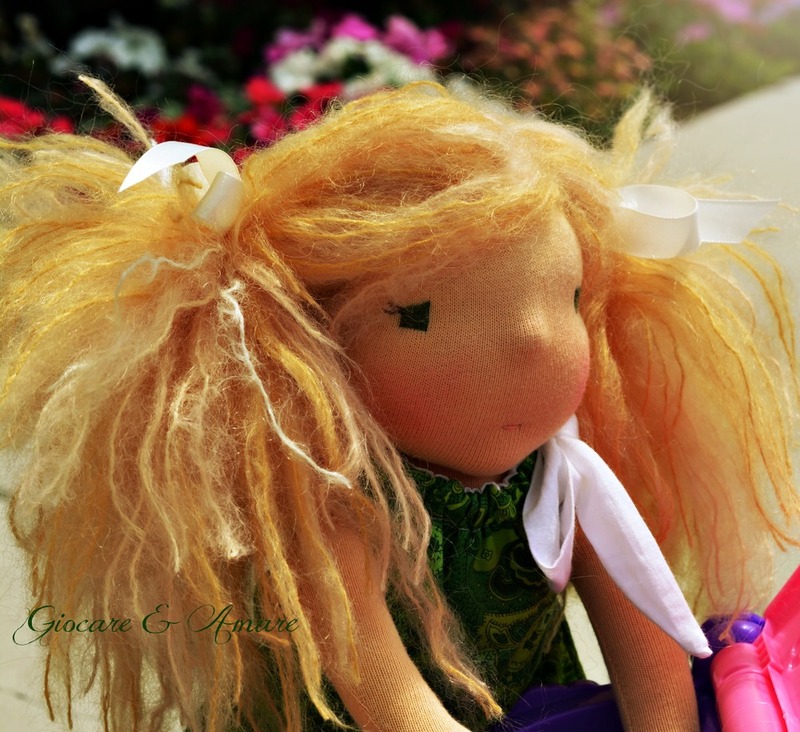 Nieve is a 21-inch custom Giocare & Amare doll, handmade of all natural materials with love by me. 'You, my queen, are fair; it is true. Sometimes a vision just stays with you and won't leave. This is true of Princess Snow, or simply Snow as I like to call her. The image of Snow came to me in the dim hours of night just as sleep was about to overtake me and it has been etched into my mind ever since. Snow was born as white as snow, as red as blood, and as black as ebony wood. What the Grimm Brother's tale does not overtly say is that Snow was born with the inward beauty and brilliancy of that white slip of snow on which her mother's drop of blood fell. That she is more than outwardly fair; she also possesses that inward beauty that is the innocence of young children. That is what I saw when Snow came to me in my dream. That is the image I attempted to capture in Snow. The innocence of youth, the stillness of morning, the brightness of new fallen snow, the vibrancy of life and the beauty of nature and all things good. Snow is more than the fairest of all, she is for me unforgettable and I will be sad to let her go. 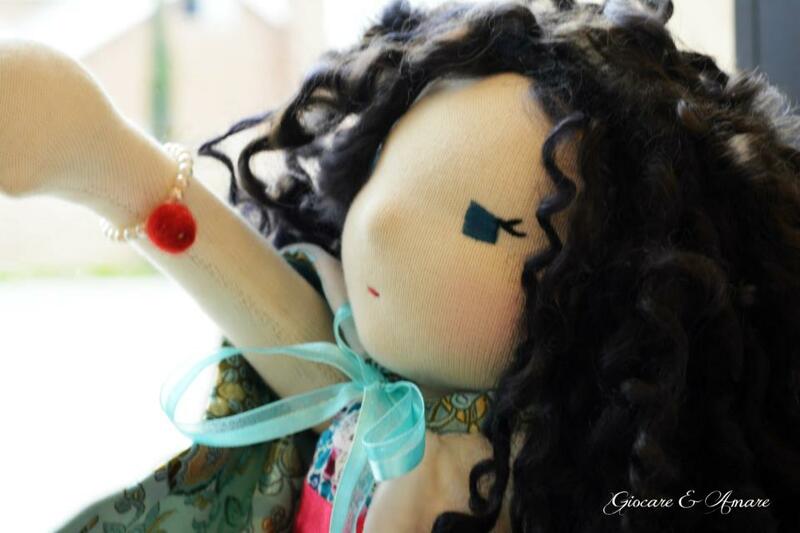 Princess Snow is a 13 inch Waldorf inspired doll hand made by me using all natural materials. She is made of 100% cotton Swiss jersey Öko-tex certified. She is filled with clean wool. Her limbs are firmly stuffed and her body is stuffed to a medium firmness that will hold its shape over time but is still very huggable. She has a fair/natural complexion and eyes the deep blue-green color of the Mediterranean Sea. Her mouth and eyes are embroidered with cotton floss. She can sit on her own and has a little bum and a belly button. Snow's hair is very special. 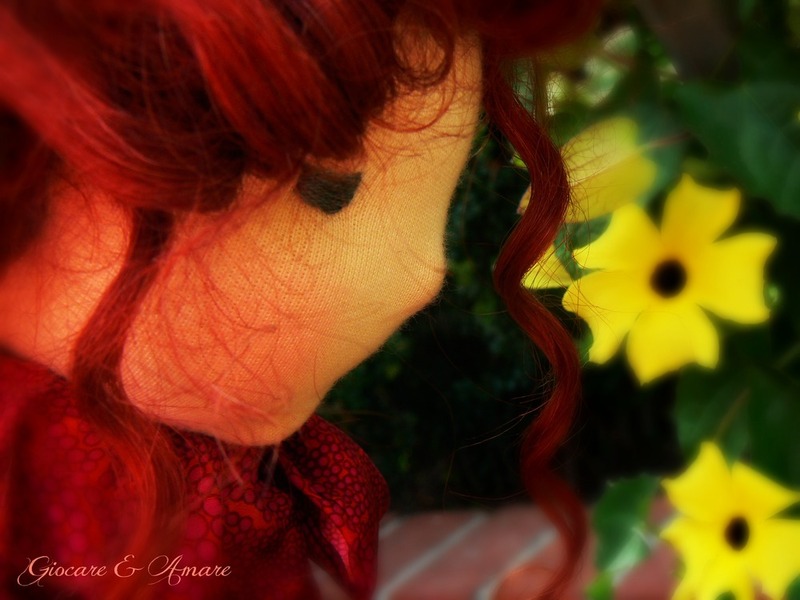 It is a handmade wig composed of Wensleydale and Teeswater locks that were hand curled into ringlets and sewn into a weft by me. It has been sturdily sewn on to a mohair cap and can be very gently hand-styled. The ringlets can be revived by spritzing with a light mist of water and wrapping around a long cylindrical object like a metal knitting needle or a marker. Snow comes with everything a little princess could want. Her wardrobe consists of undies, a day dress made from Liberty of London cotton, a silk wedding gown with tulle and lace, a reversible silk velvet and silk brocade cape, wool felt shoes detailed with mohair flowers and Swarovski crystals, a felted apple and pearl bead bracelet, and a crown made of Swarovski crystals and glass beads. All of Snow's clothing and accessories were made by me and can be seen in full detail here in her album on Facebook. Due to the presence of small objects in her clothing and accessories, she is not suitable for young children. Princess Snow is $225 plus shipping of $15 US and $30 International. If you would like to have Snow come live with you, please submit a comment below with your PayPal email address. If more than one person comments, I will draw a name on May 1st at 10 am PST.